You will be given a reference e-book to read which has 675 pages And the test will be based on that e-book , you can take final test within 1 year of purchase. WordPress is one of the most widely used content management systems on the Internet. Before the invention of the content management system, everyone who wish to be seen or heard on the Internet had to register their own web host, design their own website and acquire their own domain. Content management systems such as WordPress brought much change to this. With many free blog hosts available, and the ease of installation and configuration for WordPress, it was suddenly possible for anyone with a voice to be seen and heard on the Internet. While this may seem all well and good for those who have something to say, many may wonder exactly why such technology would be considered lucrative for the everyday professional. Well, skills with WordPress and blogging are beneficial and profitable in several different ways. First, for those who have an existing company, product or service, blogging is an excellent way to notify interested parties in developments with said concerns, as well as reach out and increase public awareness. In this vein, it is an excellent way to passively advertise without annoying the garden-variety Internet viewer. However, in this new age, a new, hybrid form of writer/journalist has arisen thanks to blogging and WordPress. These individuals write about topics in which they specialize, and through readership can earn profit both from companies who wish to have their products discussed, and from ad revenue generated by the viewers. Professional bloggers enjoy a reduced amount of schedule stress, are for the most part self-employed and work from home. For the independent, self-reliant person, this is a dream job. If one falls into a topic, or range of topics that they enjoy, it is very fulfilling. However, all is not so simple. Like any other professional field, blogging is an art form. It requires skill as a writer, researcher and conversationalist. It also requires a bit of Internet savvy. WordPress in and of itself also requires a certain finesse to be used to its fullest potential. In order to obtain this skill, one must take a WordPress course. 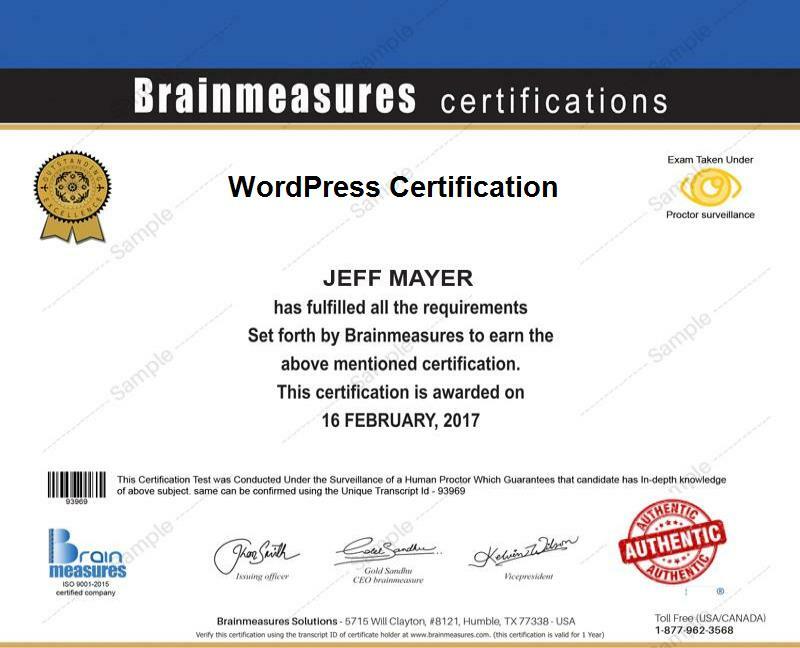 Through taking a WordPress course, one can earn a WordPress certification. This certification can make companies, writing firms and blogging sites much more interested in one's writing. The best place to obtain this kind of certificateis through online certification. Someone interested in using WordPress to blog for a living already hates rigid schedules. They don't like to have to do something or be somewhere at a specific time specified by someone else. They like to work on their own schedule, most writers do. Online certificationallows busy people to study on their own time, eliminating all of the schedules that so many people really could live without. Some online certificationproviders are better than others, which means that one of them has to be the best. Which one is the best? Brainmeasures is the number one online certificationprovider available. We go beyond standard requirements in the design of our courses. We have highly trained professionals who work closely with experienced specialists in fields we choose to teach. These specialists convey not only important information to help make the courses inclusive, but they also bring a lot of experience to the table through their stories and examples. We use the stories and examples in our courses, to convey some level of this experience to our students. A student graduating with a Brainmeasures certification will have a level of experience that students from no other online certificationprovider could possibly have. This certification consists of our inclusive WordPress course, followed by our WordPress exam. This WordPress examis essentially an online blogging test, as well as a test of comprehension of WordPress software itself. Upon passing this exam, a certificateis awarded which signifies a complete WordPress certification. This can be difficult to predict. Assuming that a blogger is popular and successful, the range can be between $70,000-$500,000 a year, depending on a wide number of factors that cannot be calculated.